The heavy narra sliding door would open and she would waltz into the room in traditional Filipiniana attire, her deep eyes boldly lined, her lips a deep burgundy and her hair up tight in a characteristic bun. In one hand, she would carry a rattling toolbox, a no-nonsense case where she kept her make-up. I used to love secretly going through that box, full of Cinema Secrets foundation in tan pots--for morena (brown) skin, like hers and mine—and gold tubes of lipstick, Maybelline mascara and a deceptive tub of Albolene crème that really held pressed coconut oil from a farm in the Visayas. In her other hand was a bag that always held something for me. I would always run up to her, give her a peck on the cheek, and flash a gap-toothed grin at her with my hands outstretched. Sometimes it would be a red and white striped bag stuffed to the brim with fluffy Red Ribbon mamon. If filming happened to be out of town, I would be lucky to try things like Laguna pastillas, wrapped in colorful delicate paper, or sticky puto and kutsinta from Batangas. 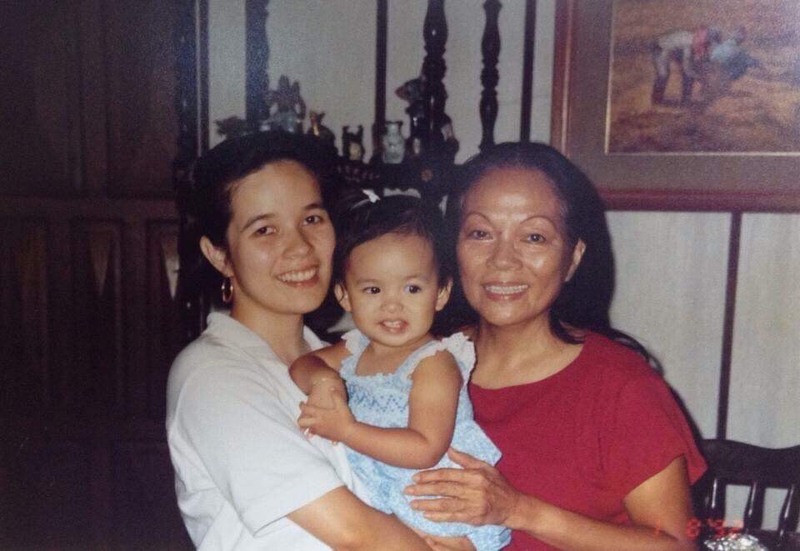 My parents and I lived with my grandmother, Caridad Sanchez, during that chapter of her life when she was filming the educational television show “Bayani.” Every week, children would watch her on local TV as the enchanted Lola who could transport curious siblings to various points in Philippine history via a magical bubble. It was only when I was much older that I began to wonder what made my grandmother turn out the way she did. As the narratives fade and the details diminish with each passing year, so increases the urgency to write and remember meaningful moments unbeknownst to most. When asked about resilience, she returns to stories of where her life in film began: at the LVN Pictures studio. In an attempt to better understand the grandmother who raised me and the context that so greatly shaped the person she would become, I sought the histories of the women she worked closely with at the time. On a sprawling lot in Quezon City stood the LVN Pictures studio. Named for the initials of the three founders--Narcisa Buencamino Vda. de Leon, Carmen Villongco and Eleuterio Navoa -- it was one of the country’s leading film studios. The postwar period between 1946 to 1960 is often referred to as the Golden Age of Filipino Cinema, and LVN was among the top three studios--Sampaguita, LVN and Premiere—creating films that contributed to that era. LVN was known for entertainment that presented a more idyllic Filipino life, one of attractive young men and women singing and dancing in scenes of blissful provincial existence, espousing values that were distinctly Filipino, almost like the vivid landscapes of Fernando Amorsolo brought to life. Integral to every historical account of LVN is a homage to Narcisa de Leon or Doña Sisang. An entrepreneur in the truest sense of the word, she grew her family’s estate with bountiful haciendas and smart investments that would allow her to establish the film studio in the latter years of her life. It can be argued that Philippine cinema in the 1950s-‘60s was one of the industries where women held prominent positions of power despite society remaining patriarchal. Doña Sisang and Sampaguita’s Mommy Vera were not only astute businesswomen and successful film producers, but they also ran their studios like matriarchs of a family, taking a very hands-on approach with all aspects that would be critical to success. This carried over in their choice of talents and the contractual stipulations for them, similar to rules parents would set for their children. The stories of how these stars were selected differ greatly from one another. Many of them were chosen because they filled a certain mold--mestizo or mestiza, with the ability to sing or dance. Luz Valdez was a huge movie fan waiting for a glimpse of her then-idols, Gloria Romero and Nida Blanca. One afternoon while in the crowd of fans she caught the eye of Doña Sisang herself. “Wala sa plano ko ang mag-artista,” (It was never my plan to become an actress), she shares. “Pero buti na lang ginawa ko, kasi napaaral ko lahat ng kapatid ko. Natulungan ko ang pamilya ko. In time, I fell in love with acting.” (But good that I did because it helped me put my siblings through school. I was able to help my family.) Valdez would be one of the stars residing on the LVN studio property itself, and Doña Sisang would recognize this charming, determined actress’ talents and immediately give her a leading role in her first LVN film. My grandmother’s origin story at LVN is slightly more unorthodox than that of her peers. As an actress in Visayan films and part of a popular Cebuano love team with a young actor named Tony, it was love that brought her to Manila. When Tony left to try his luck, my grandmother followed soon after he had been hired by one of the smaller studios. He failed to meet her at the pier upon her arrival. After three months of searching incessantly with the help of a cousin, and with her 500-peso allowance dwindling, she had all but lost hope in finding him. One afternoon, she received a call that Tony had been sighted in Escolta, at a restaurant called La Buena Suerte. She rushed over to see him, but instead of the joyful reunion she anticipated, she found herself rebuffed. My grandmother fled Escolta and found herself walking despondently across Jones Bridge, until she reached the Quiapo church. Weeping and staring at the Nazareno, she suddenly had an epiphany: “Kung ang Nazareno nga na maitim ang balat minamahal ng marami, bakit ako hindi puwede? (If the Nazarene is dark-skinned and adored by many, why can’t I be as well? )” With renewed resolve, she returned home and called an old friend she had met in Cebu. For Valdez, it was the film “Chinita,” where she played the lead role. In an industry where there was a preference for mestizos, it was a breakthrough film for her not only because she held top billing, but also because it signified the start of studios considering stars less conventional than the usual mold. It was her way of making a mark and finding her place in her new world of film. The lives of these LVN women were as diverse as the films they starred in, but there were three overarching themes that encompass their experiences. First, the friendships they forged, filled with moments of helping one another, would be strong enough to withstand the test of time. Second, much of the meaning in their work was found in the impact it had on the Filipinas they inspired. Finally, what carried them through was an absolute dedication to their craft and a love for film and acting. On the evening that I interviewed these ladies of LVN, I would discover that they were in fact all together only hours before. As part of a group called “Showbiz Balik Samahan” these ladies and gentlemen from the major studios continue to get together to reminisce the old days. What they have, after all, is founded on shared experiences of lives spent working hard, often helping one another through rough patches. Nowadays, Luz Valdez wakes up between 3 or 4 a.m., runs through her lines, and goes off to location for her TV work. In many ways still the strong and spunky girl of her youth, she remains one of a handful of actresses from that period still acting. Marita Zobel, still beautiful, fills her days with family and friends in prayer. An artist at heart, she credits her good health and disposition to music, beginning her days playing favorite songs and dancing by herself in her room any chance she can get. DeOcampo, Nick. Cine: Spanish influences on early cinema in the Philippines. Quezon City: National Commission for Culture and the Arts, 2003. DeOcampo, Nick. Eiga: Cinema in the Philippines during World War II. Mandaluyong City, Philippines: Published and exclusively distributed by Anvil Publishing Inc., 2016. Interview with Luz Valdez. Telephone interview by author. February 11, 2018. Interview with Marita Zobel. Telephone interview by author. February 11, 2018. Pia Guballa is a medical student at Ateneo School of Medicine and Public Health.